This still from a NASA animation shows the orbits of the five planets residing in the Kepler-20 star system 950 light-years from Earth. The alien solar system is home to two Earth-size planets, the first such exoplanets ever found. Comparative sizes of Kepler planets, through Kepler-22b. 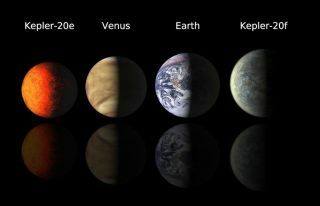 Astronomers searching for another Earth are getting closer, thanks to recent discoveries by the Kepler space telescope. [See our full infographic on the types of alien planets here. This illustration shows all 1,235 of the potential alien planet candidates NASA's Kepler mission has found to date. The planets are pictured crossing front of their host stars, which are all represented to scale.